SKOHRboard: Werth is Worth What to Washington? Jayson Werth is definitely smiling no matter where he is and no what jersey he is wearing today. Over the weekend Werth signed a 7 year deal with the Washington Nationals worth a guaranteed $126 million. Yowza! It's not quite the kind of ridiculous deal that Jeter just got but that is a lot of money for a guy who never really produced until he got to bat behind Utley and Ryan Howard. Personally I think Werth is a great baseball player and loved him with the Phillies. 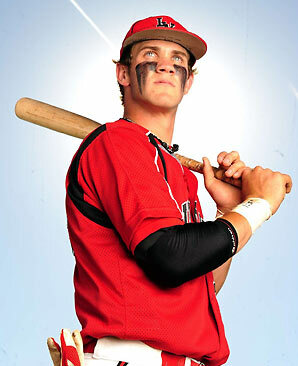 I mean look at that guy, he just looks like a baseball player. Not exactly the slicked back "clean" look of a Chase Utley. But he is definitely getting pretty close to that. Hopefully for the Nats Werth can continue to produce but in more of an "empty" batting order especially with Adam Dunn playing in Chicago. There is actually a rumor going around the ESPNs of the world that the Nats are pushing for Cliff Lee. That would be a huge steal for them and could actually pay off immediately unlike their two phenoms Strasburg and Harper who might still be a few years away from having a major impact. If you add Lee and consider they have a very under-rated 3rd baseman in Zimmerman is it possible to believe that the Nats could be a good team next year?